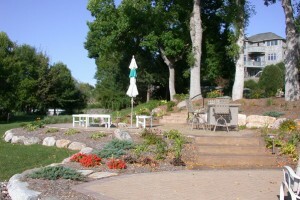 Landscaping can add tens of thousands of dollars to the value of your property. In fact, it is one of the few home improvements you can make that not only adds value immediately, but also increases in value as the years go by. While interior home improvements regularly go out of style and mechanical systems wear down, but plants grow fuller and more robust as the years go by. While trying to sell your home, you may find prospective buyers aren’t getting past the front door to appreciate your exceptional interior design. The problem? Your home may lack “curb appeal”. If buyers don’t want to stop at your house, you have little chance of them ever seeing the inside of the house or the backyard. A beautiful outdoor space can also help set the stage for the rest of the tour. In the time a perspective homebuyer spends waiting for the Realtor to open the front door (referred to as the “lockbox impression”) they are taking in the sights and sounds of the home and forming an impression that will stay with them as the view the rest of the home. The most important words in landscaping are curb appeal, curb appeal, and curb appeal! Curb appeal is the allure or attraction to a home from the exterior. Many factors contribute to a winning curb appeal, such as fresh paint, manicured shrubs and trees, and the lack of clutter. However, one of the most effective ways to enhance your home’s curb appeal and increase the resale value is through landscaping. First impressions go a long way and landscaping is part of the first impression. Potential home buyers form their first impression of a home from its curb appeal. 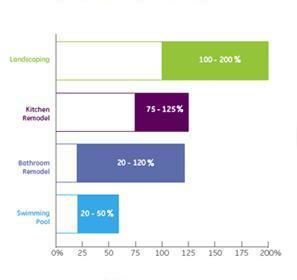 Yet often a home’s outdoor landscaping is overlooked, or underdone, in the preparation for the sales process. An attractive and well-maintained landscape can add as much as 15 to 20 percent to the value of your home. Average returns can be upward of 100 to 200 percent. If you invest $1,000 in landscaping, you can get double back. Not too bad, huh? Choosing to do nothing or allowing shrubs to become overgrown, which blocks out natural sunlight and obstructs the exterior of the home, can negatively affect the price of a home. You want to expose the home and have a feeling of openness just as you would with the interior. The home should be the main focal point. Everything around the home should flow and tie into the structure. This will yield the “WOW” factor in any landscape design. Think of your yard as a room. Furniture and attractive retaining walls define the room, and accents express your personal style. You might personalize your garden with a water feature (fountains, waterfalls, and ponds) and garden art that provide a sense of drama or whimsy. Or, have some fun. Put a few pink flamingos and plastic alligators on your lawn. This is your yard! Even though one of the goals is to landscape to increase your home’s value, it’s your place to live and enjoy right now, too. Homeowners wanting to increase the value of their property will do well to consider the cost-effective, return potential of quality landscaping, and to safeguard their investments by hiring a certified, professional Minnesota landscape contractor to perform the work. Carefully blended and maintained colors and textures will not only add curb appeal and value, they will also serve as a source of daily pleasure. Do not just take our word for it though! Take a moment and browse our photo gallery to view the type of landscaping design and lawn care ideas to think about!